The premier minibus, motor coach & charter bus rental company servicing New Jersey. Book your charter bus now by calling (201) 258-7022. Looking for bus rentals in New Jersey? GOGO Charters is your #1 choice for group travel into, out of, and around the state. Whether you're traveling for a wedding, corporate trip, sporting event, school trip, church outing, or private vacation, we'll make sure you're paired with the perfect bus for your group. With bus options ranging in size from minibuses to full-sized coaches, we're sure to find the perfect one for you. You'll be able to choose from amenities such as plush reclining seats, air conditioning, large panoramic windows, WiFi, televisions with DVD players, and more. We'll also pair you with an experienced driver who will transport you to each stop on your itinerary on your time. Our reservation specialists are available 24/7 to get started on your rental and provide you with a free, personalized quote! Call us any time at 1-855-826-6770 to rent your charter bus today. Situated on the east coast of the mid-Atlantic region and bordered by the Atlantic Ocean, New Jersey is often visited by tourists for its lovely beaches and natural beauty. For your next trip into this beautiful state, book a coach to enjoy personalized travel accommodations. You'll be paired with a bus outfitted specifically for your group, operated by a driver who will travel on your time and go everywhere you go. Instead of relying on public transportation services, which can operate on fixed schedules, or using rideshare apps, which can separate your group, book a personal bus to keep your group together while you travel. You'll be able to enjoy your time together while your driver handles the stresses of navigating city roads. Move your small group around with ease with a personal minibus, perfect for groups of 35 or less. With various options designed to hold 18 passengers, 28 passengers, 30 passengers, or anything in between, these small buses are perfect for a more intimate mobile setting. While you travel, you’ll be able to relax with reclining seats and enjoy the view through panoramic windows. Schedule a shuttle for easy travel around a city or take a day trip for a nice change of scenery. Either way, we’ll make sure you travel in comfort. Attractions: The New Jersey Shore welcomes you with beautiful beaches, boardwalks, arcades, water parks, and amusement parks, all together including hundreds of rides and attractions. Lake Hopatcong, the largest freshwater body in New Jersey, is the perfect lake for boating and swimming, after which numerous restaurants and bars provide you with the perfect opportunity to wind down after a day out on the water. If you're a fan of amusement parks, head to Keansburg, a boardwalk amusement park with hundreds of classic amusement park rides. National Parks: New Jersey is home to numerous natural parks ideal for outdoor fun and spending time surrounded by nature together with your friends and family. You can choose to hike part of the Appalachian National Scenic Trail, all of which spans over 2,000 miles up the USA's east coast. Relax in the Gateway National Recreation Area, discover wildlife in the Great Swamp National Wildlife Refuge or set up camp at the New Jersey Pinelands National Reserve. 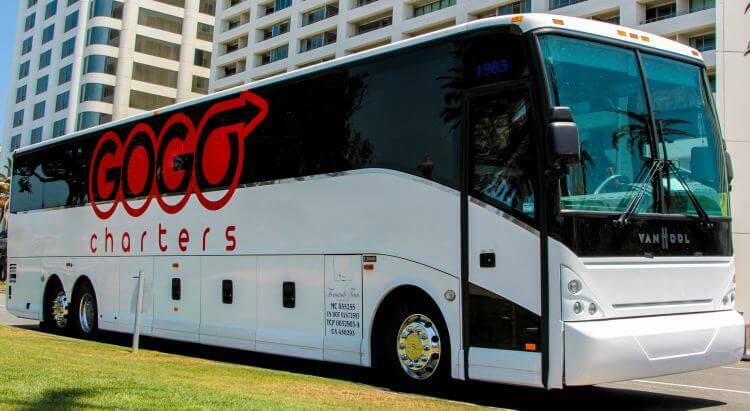 Choose a bus with GOGO Charters and our team will be there to help you with your bus rental 24/7. We are dedicated to our customers and to providing modern charter buses in perfect technical condition. No matter what type of bus you need, we've got you covered. Call us today at 1-855-826-6770 to receive a free quote for your next bus rental! Atlantic City, Jersey City, Newark, Paterson.